Just a quick update on the Park City Chamber email list article from back in May. The plan was to take the 1200 or so contacts from the Chamber list and send one last unsolicited message requiring each recipient to explicitly subscribe if they wished to continue receiving the newsletter. Results: 65 out of 1200 recipients continued their subscriptions. That’s not self-deprecation talking… Of all the emails I receive from Chamber members, there are only a handful that I actually read, or that actually pertain to my sphere of relevance. It must hold true then that most members don’t find my newsletter relevant either. To the 65 of you who did subscribe, I thank you. I’m looking forward to sending out my first campaign through Campaign Monitor in the next month or so. I hope you continue to find it relevant and informative. Feel free to forward it on. If you meant to subscribe but it just didn’t happen, no worries. Scroll down to the footer and you’ll find a hand sign up form. You’ll be on the list instantly. And if you decide later that it isn’t for you, unsubscribing is just as easy. Letme subscribe and read more articles. More articles or news more power! I feel your Pain…. 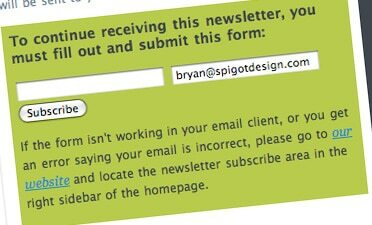 Where do I “OPT IN” to recieve your email newsletter? If for no other reason than the fact that I fully understand the frustration and the issues revolving around this issue. All in all it worked out ok. The Park City Chamber has stopped giving out that email list, and instead publishes a bi-monthly email newsletter of their own with offers from members. If you look in the footer you\’ll find our newsletter sign up form. CAN-SPAM act, every one is a winner. The plan is to build the “Official CAN-SPAM compliant” opt in button into the Chamber website so visitors to the Chamber site can specifically sign up to receive email from businesses they want information from. Therefore they will directly opt-in to any email they will subsequently receive. I think there is a business opportunity here! Work with Chambers to facilitate communication between businesses and clients seeking info. Obviously this is a widespread issue. Upgrade chamber websites to be CAN-SPAM compliant. Opting in when joining your Chamber sounds like it should cover you, but it wasn\’t specific enough for them (or any other email marketing company I spoke with). The Park City Chamber tried to make a deal with a few of these companies to allow their members to use their list, but it never worked out. Thanks for taking up this torch though. Let me know if you find the solution. There will be an opt in button for each individual business. So the visitor to the chamber site will have to opt-in individually to each business. This should cover it! That’s the plan anyway…. The whole idea is to make the entire system CAN-SPAM compliant.